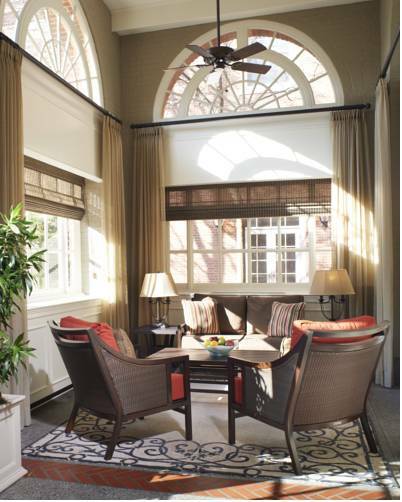 Escape to sophistication at The Dearborn Inn, A Marriott Hotel. Our renowned property, built in 1931 on the former grounds of Ford Motor Company, boasts 23 landscaped acres in a prime location near Dearborn Heights. Visit The Henry Ford Museum, Greenfield Village and the Automotive Hall of Fame during your getaway. Retire to one of our stately rooms and suites in the Main Inn, or take up residence in one of our five Colonial Guest homes or two Colonial lodges. All quarters feature luxurious bedding and thoughtful amenities. Enjoy delectable dining in our two restaurants, Edison's and Ten Eyck Tavern. Stay active by exercising in our fitness center or strolling through our well-manicured grounds. If you'll be hosting a business or social event, find the perfect space among our 17,000 square feet showcasing stunning chandeliers and classic details. In season, our landscaped lawns and gardens are ideal for memorable weddings. Let The Dearborn Inn, A Marriott Hotel exceed your expectations while in Michigan. Edison's: Edison's serves traditional American fare for breakfast, lunch and dinner with classic architecture as a backdrop. The large arched windows at our Dearborn restaurant overlook our hotel's beautiful grounds. Ten Eyck Tavern: Whether it's the late afternoon or early evening, this gathering spot serves light fare and beverages to satisfy. Gather with friends, family and co-workers at one of the most convenient restaurants near the Henry Ford Museum.